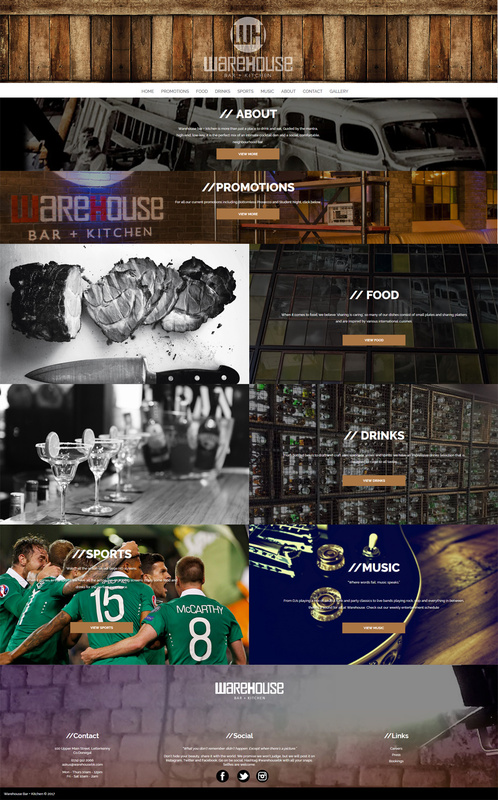 Warehouse Bar + Kitchen is a brand new food and drink experience in Letterkenny, Co.Donegal. Focusing on great food and drink with live sports and quality live music. 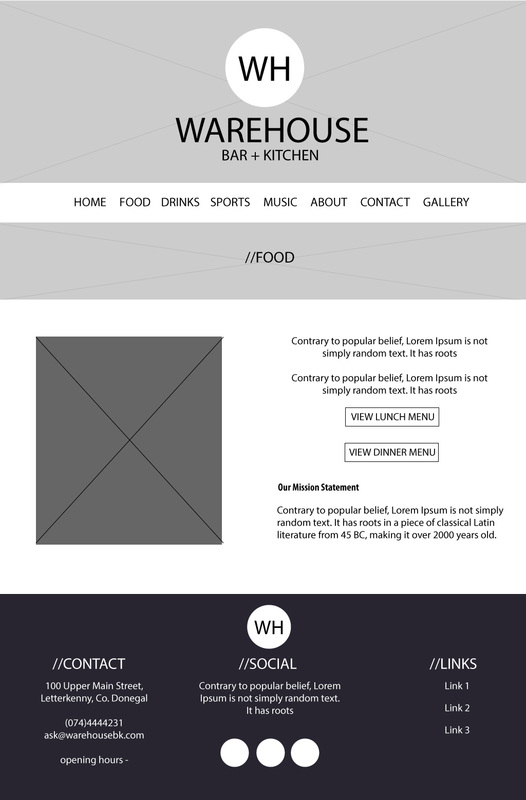 The task was to build a responsive website to help with the launch and contain inforamtion such as opening hours, contact information, sports and music line ups and various food and drinks menus. The site had to be mobile friendly as the rate of mobile use is constantly growing and in some cases out ways traditional desktop usage. During the research phase it was discovered that the target audience for the venue would be male and females in their late 20's - early 30's, who would be trendy and possibly fashion conscious. With an estimated 20,000 people living in Letterkenny, there was a chance for something new to appear on the market. This helped to create personas to focus the design thinking (fig 1). With an industrial theme (which was carried over onto the website), the aim of the venue was to provide live sports on several large screens, great live entertainment and great food and drink. All of which should be easily found on the website using any device i.e. desktop, laptop or mobile. Requirements for the site were established by the stakeholders, in this case the marketing and sales team. Once the requirements were established several sketches helped establish the user flow of the website (fig 2) and gave the stakeholders an idea of what the site layout would look like. 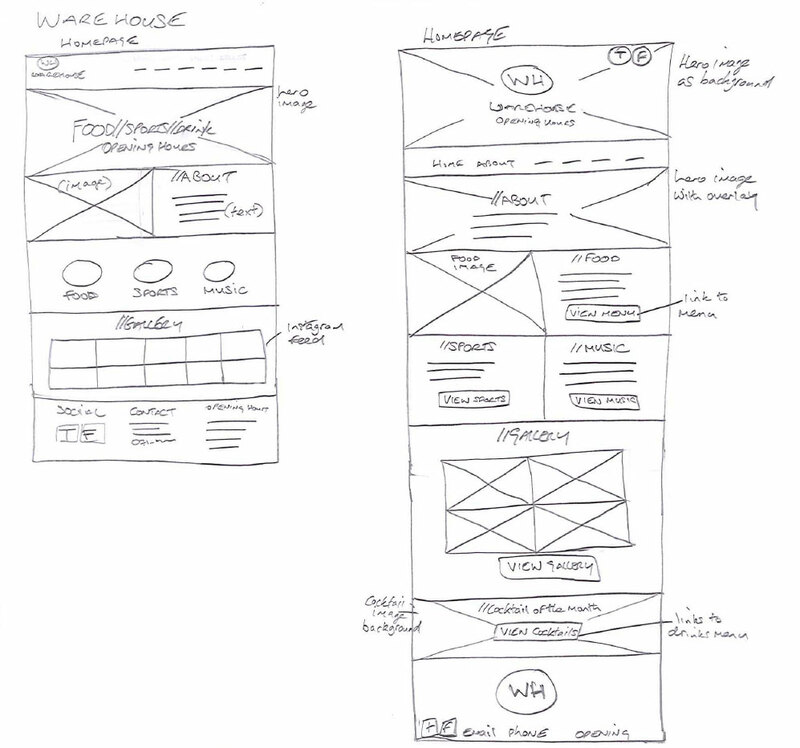 Based on feedback from wireframes (fig 3 and 3.1), a layout was chosen and a high fidelity mockup created (fig 4). 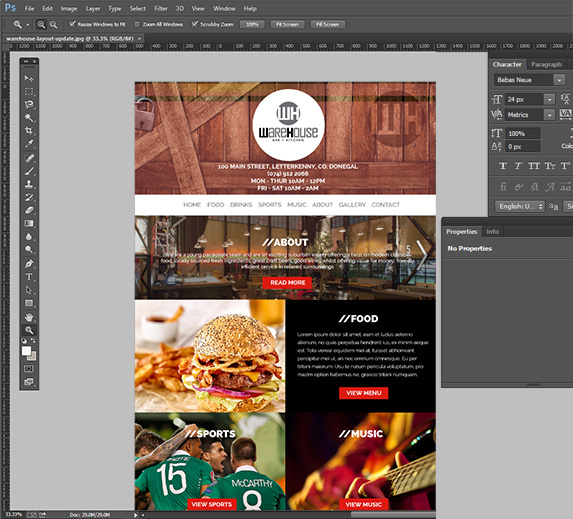 These mock ups helped to see what the site could look like at a more detailed level. An iterative process was something implemented through out the design and several mockups were created based on the feedback. 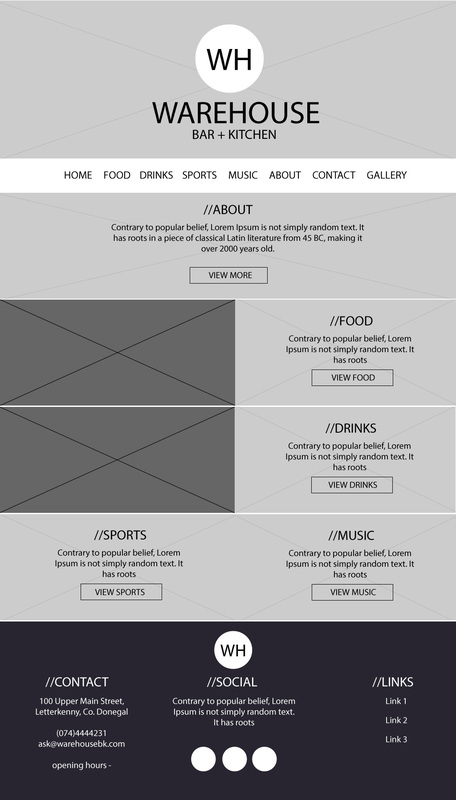 Now that a design and layout was agreed, the development of the website could start. This site is a responsive website, accessible on multiple devices and powered by WordPress. To aid with ease of updating for someone who may have basic knowledge of WordPress, custom post types were created for several cateogries i.e. 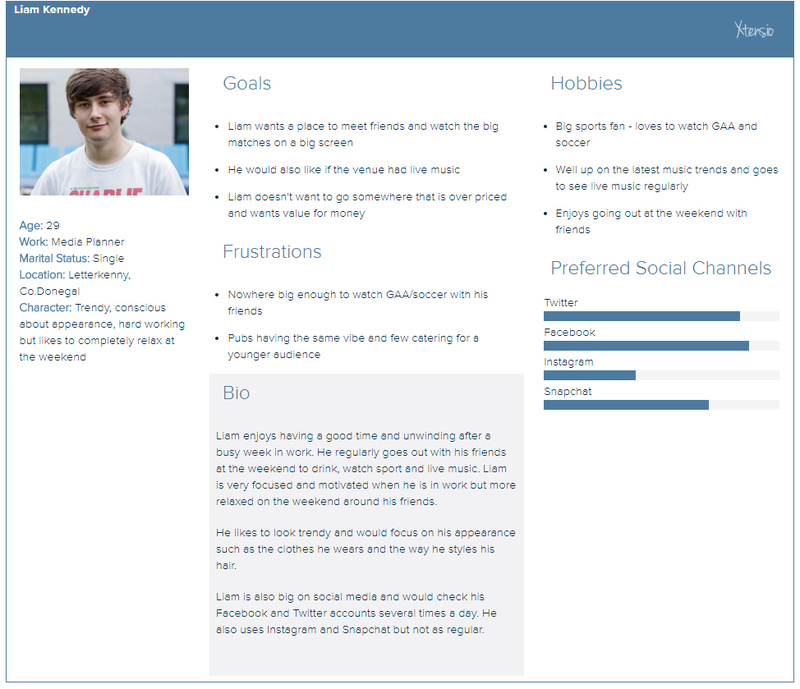 promotions, press articles and music events which makes these sections easy to access in the WordPress dashboard.